19-year-old Fardos has been sentenced to 20 lashes and a large fine for being âEUR~indecently dressedâEUR(TM). 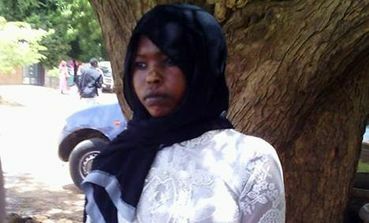 She is one of 10 Christian students who are facing flogging after they were arrested outside their church by Sudanese police last month. No woman should be flogged for her dress. Signed petition, shared on facebook, Google+ and twittersphere. Every signature makes a difference. We have freed prisoners of conscience, stopped executions and called authorities to account for over 50 years. Signed and shared. Thanks Dogan. Signed. "Indecently dressed"...WHAT the hell is that...????? This is barbaric but it's nothing compared to what those criminal psychopaths in ISIS would do. What astonishes me is the fact that last time I was in Khartoum (2006) I was wearing my usual - trousers as well as knee long dresses and half sleeves in public and was never faced with any problem? What has changed? have they simply gone bunkers? Signed & noted. Thanks, Dogan. Gladly signed and noted! Thank you. (sigh) an other country with no men in it , just religious freaks . cause if there was even one man to stand up to the religious crap they go by over there , this wouldn't be happening . but also this is to be expected when religion runs the country , the (men?) at least that's what they call them self ,obviously can't control their hormones . and so as in most countries where religion is involved the Women suffer . Surjit - thank you for the correction ... in my reading it's the same difference ;-) but you're correct(er). Frankly I don't care if it was pre Medina or after or before or after sunset; fact is that it's still valid according to almost all of the scholars and for me that's what counts. I quite obvious know a different breed (= normal) Muslims here in Egypt than you do in England - LOL. I'd exchange them if I were you! Seriously - only warped "Muslims" can come up with such decisions like the ones we gather signatures against. As for your remark to David - what's happening right now in (Christian) America re women's right by the teabaggers is not really to be called a love affair IMO neither is the situation in (Christian) South America or in (Hindu) India were 1 Mio women get killed in 1 year just because they're women to be. It might carry different labels but if you dig a bit you'll find the truth. And again - whatever label is stuck on anti-women actions and laws ... the difference is the same: WE suffer the consequences all in the name of male dominance. Perfect world outside the Islamic one and sure worth to point fingers ... in doing so three always point back ...! Cheers! Sad to be having to sign this in the year of 2015. How long does it take for common sense to rule? Oh well, keep chipping away, I guess! Thanks, Dogan. Cave man laws need to be updated. They are cruel and sexist and any country using these sadistic laws should be ostracised. Email sent but we may as well be howling down a wind tunnel. You're right Maggie. Islamist tyrants like these are never going to change unless they get the boot. Signed of course. Thanks Dogan. Noted & signed! Thank you, Dogan! This is so backward it's hard to believe. What is not being mentioned is that this is a Muslim controlled country and that their victims are minority women deliberately targeted. Signed & noted , Thanks Dogan.